Jane the Virgin's fifth season is off to an amazing start, and there's already so much to digest. There's the return of Jane's formerly deceased husband Michael, who remembers nothing of his former life - let alone his wife - as well as Jane's relationship with Rafael. Oh, and the seemingly endless schemes of Sin Rostro, aka Rose. There is so much going on in each episode, we almost forgot this is the show's final season. Unfortunately, because this is the last season, it means all the craziness is just building up to the end of Jane the Virgin. And as hard as that is to process as a fan, it's only harder for the cast themselves. On Wednesday, April 3, the cast and crew of the series took to social media to express their bittersweet feelings about the series' last-ever table read. Showrunner Jennie Urman shared her thoughts with fans on Twitter, writing, "No big deal: just the last table read of #JanetheVirgin ever today!" The three crying emojis she added to her caption really emphasized the sadness, we must say. 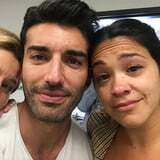 Actors Justin Baldoni, Yael Grobglas, and Andrea Navedo (who play Rafael, Petra, and Xiomara, respectively) took to Instagram to share their thoughts, each one taking the time to express their thanks to the fans for making the beloved show the hit it is. "Ends are always hard. We've grown up together," Baldoni captioned a photo of himself with Grobglas and Gina Rodriguez. "It's the end of an era but the beginning of so many incredible things. Our show has given birth to so much beauty in all of our lives. So many tears. But they are tears of gratitude." Jane the Virgin's very own Latin Lover Narrator, Anthony Mendez, also joined in, posting a video on what he called, "Woe And Wepa Wednesday." Whew, we're getting a little teary-eyed ourselves, and there's still several more episodes of season five to go! Watch the emotional tributes ahead, but don't fret too much - we still have the rest of season five and a whole spinoff to look forward to!